the working class to derive it. 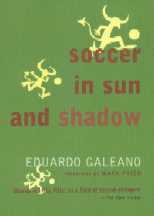 What can you say about Eduardo Galeano? Basically he has rewritten the same book Las Veinas Abiertas de America Latina over and over again, with the usual Marxist crap. There is no question that the man is a soccer fan, but he can't resist in trying to make his work another story about how everybody is viciously exploited by capitalists, who have essentially ruined soccer by supressing the art. Oh well, Eduardo, you should have moved to East Berlin when you had a chance. Then you could have supported BFC Dynamo Berlin, the secret police club that cheated their way to 10 straight GDR titles, and you could have lived in your socialist paradise to boot! Or perhaps to get some real solidarity with the working class, why not go over to the Millwall Firm wearing a ManU jersey and demand a seat?